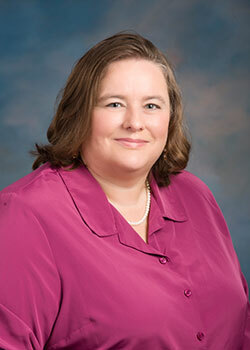 Dr. Joyce Easter is Dean of the Batten Honors College of Virginia Wesleyan University. She received her B.S. in Biology from Cornell University and her Ph.D. in Biochemistry from Duke University. Before joining the faculty at Virginia Wesleyan University in 2000, she was an Assistant Professor of Chemistry at Eastern Illinois University. She was the recipient of both VWU's Samuel Nelson Gray Distinguished Teaching Award and the United Methodist Church Exemplary Teacher Award. In addition to teaching chemistry, Dr. Easter also previously served as the Director of the Honors & Scholars Program. Dr. Easter's research focuses on natural product biochemistry, such as the detection and isolation of bioactive compounds from marine invertebrates from the Chesapeake Bay and the Eastern Shore of Virginia. Marine invertebrates are a rich source of substances with antimicrobial, antiviral, cytotoxic, and anti-inflammatory properties, and therefore potential lead compounds for new pharmaceuticals. She is also interested in the integration of green chemistry into the pharmaceutical industry, both in the synthesis of pharmaceuticals and the identification of potential renewable pharmaceutical feedstocks. She has been involved in pedagogical research and curriculum reform for more nearly 20 years as a member of Project Kaleidoscope, the American Chemical Society, American Society of Biochemistry and Molecular Biology, and the POGIL Project. She has developed innovative teaching materials and developed inquiry-based experiments for her biochemistry and organic courses. Dr. Easter is originally from northern New Jersey and the Finger Lakes region of New York. She currently resides in Virginia Beach with her husband, Loran.